Asian Para Games 2018 has been successfully held in Indonesia. 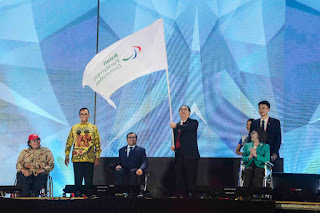 The closing ceremony held on 13th October 2018 at Madya Stadium (Gelora Bung Karno) and has made its own history for Indonesian paralympic sports. Indonesia managed to collect 37 golds, 47 silvers and 51 bronze medals, and on fifth position of standings. Exceeds the initial target of 16 golds. This brilliant achievement is certainly not obtained easily, especially Asian Para Games is a sport for those with special needs. At the end of the speech during the closing ceremony, Raja Sapta Oktohari as Chairman of INAPGOC asked "Is the Indonesian the best of Asian Para Games?" to Majid Rashed as Chairman of Asian Paralympic Committee (APC). Raja Sapta Oktohari is certainly curious about the assessment of the 2018 Asian Para Games preparation for the past 15 months. Majid Rashed answered "Yes, It is." Majid considers that Indonesia has successfully held the 2018 Asian Para Games and is the best host of this event. The assessment as the best host is certainly not obtained from the success of the event. But the Indonesian Asian Games Organizing Committee (INAPGOC) paid attention to the details of all places that were suitable for disability. Like the road to the stage without stairs, disability toilets, special busway rides, friendly volunteers who are ready to help athletes to direct and even help push their wheelchairs. The next Asian Para Games will be held in Ghangzhu, China on 2022. Indonesia also looks optimistic at least in the 5th position of the standings in the next 4 years.